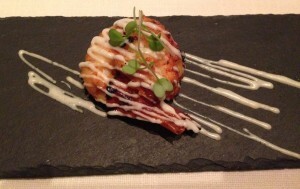 Indian Accent has been called the “best Indian restaurant in India”. It’s a big title to hold, so of course I had to try it out for myself. It’s a fusion restaurant, and I’d been told by foodies I respect that it was superior to one of my favourite restaurants in Mumbai, Masala Library, which is of similar ilk. I had one night in Delhi on the way to my next adventure in North East India, so my travel companion and I decided to splurge on a nice meal before backpacking. We got off to a rough start, trying to find the restaurant was a little more challenging than expected, and our rickshaw driver was less than helpful. As we tried to decode where Google maps was telling us to go, we managed to frustrate our driver who just gave us some rather disapproving looks, “stupid women” his eyes said as he looked in the rear vision mirror. A little flustered and in need of a steadying gin and tonic, we arrived a little late and were seated swiftly. The environment is elegant, black and white photos of Delhi landmarks line the walls in understated style. Without little contemplation we ordered the degustation, and before I could sip my gin and tonic, our first course arrived. A miniature naan oozing with blue cheese was presented to us. 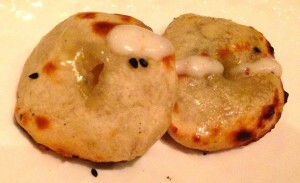 It had never occurred to me that blue cheese would go so well with Indian breads, but the pairing was flawless. It was flavourful and a nice way to start the meal. 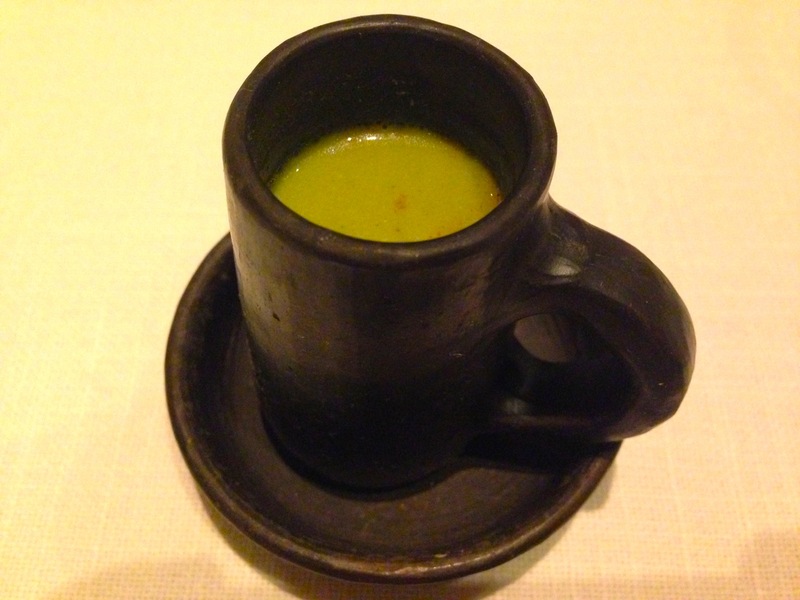 As soon as the plates were cleared we were presented with a hand moulded tiny black jug filled with a pea green soup. This was creamy, and delicious with a hint of garam masala. The balanced flavours and slight heat was perfect to warm us up on cold winter’s night. I could have been served an entire bowl of that soup for my meal and been perfectly happy. 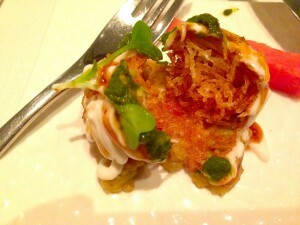 The potato sphere chaat with pea ragda was crunchy, shredded potato was wrapped tightly like a small ball of wool, fried to perfection and served with a delicate blend of chutneys and wedge of watermelon. I’m not a fan of watermelon, but tried it and found the soft cooling effect complemented the crunch and spice of the chaat. 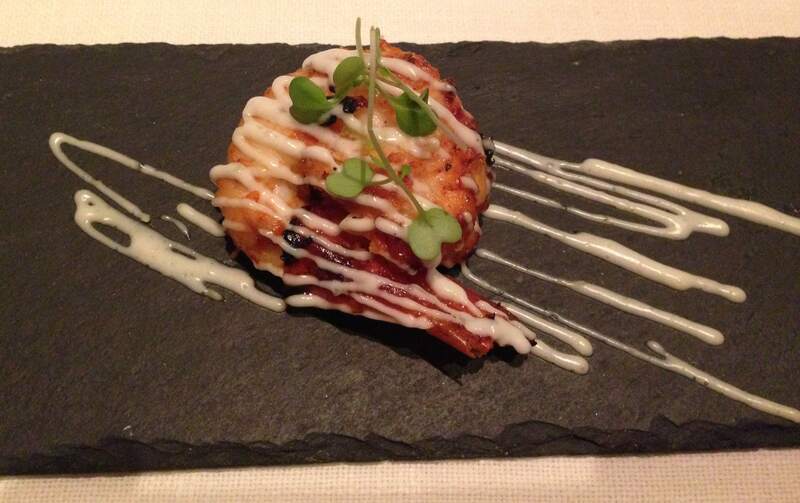 This was aloo tikki with a twist. Next up the duck khurchan cornet to with golden raita and chilli chutney was presented. Looking like a mini ice-cream cone, the duck was cooked to perfection with fragrant spices, set off by the crunch of the cone. This was the highlight of the meal for me, the only disappointment was that there was so little of it. 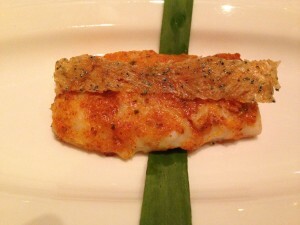 The next course was baked bass fish served with a masala butter and white bait papad. While the crunch of the papad added to the dish, this was rather bland for my liking and added little to the meal in my opinion. The next dish was pork spare ribs that I passed on (I don’t eat pork), but my companion seemed to enjoy it. In its place I was presented with the a prawn that had been cooked in the tandoor and drizzled with a wasabi malai cream. This had the potential to be overpowering, but the kitchen demonstrated restraint which made it a lovely and light dish. 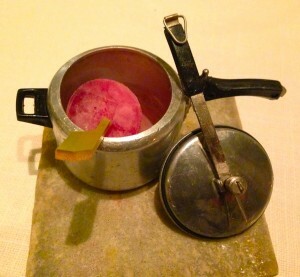 To cleanse the palate a popsicle of pomegranate and churan was presented to us in mini pressure cookers. This was sweet with a little fizz. While it was a refreshing cleanser, our waiters seemed eager for us to move on, they even started serving the next dish at our table before my companion had finished this course. We had been flying through the courses, with no break in between dishes. While each course was lovely, the experience would have been enhanced significantly if we’d had a chance to savour each course and rest in between. The main meal was a crunchy fillet of rice crusted john dory which was surrounded by simply the most delicious moilee my tastebuds have ever had. The scent of fresh coconut filled the bowl, the saucy creamy but without being overbearing. It was lovely although didn’t really seem to fit with the accompaniments of black dairy dal, duck kulcha and cucumber and wasabi raita. 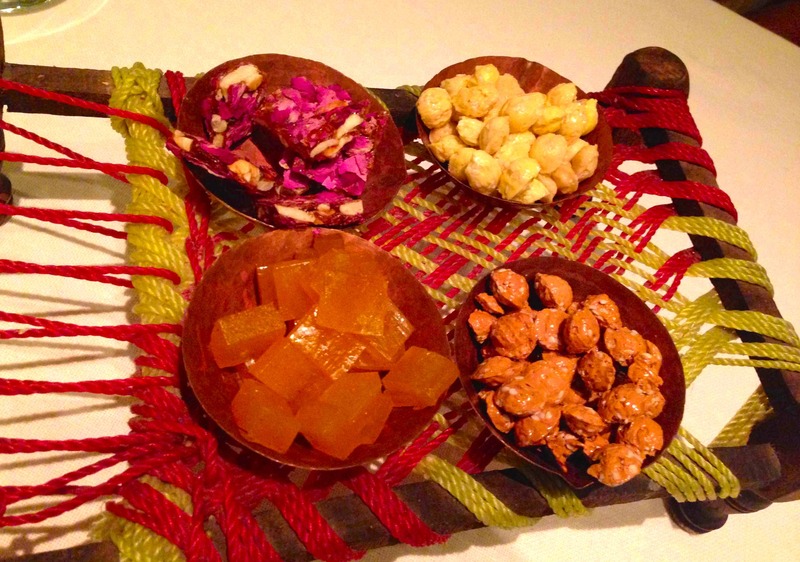 On its own, each component was delectable, but together it felt like an awkward combination. Aside from the moilee, the duck kulcha was again a highlight, but then I clearly my taste buds have a bias for duck! Stuffed to the gills, we weren’t sure if there was actually any room for dessert. We’d eaten 7 courses in 65 minutes! But we steamed ahead like troopers. Dessert was a tasting plate of three dishes; Haji Ali inspired custard apple cream, warm doda burfi tart and vanilla bean ice cream. 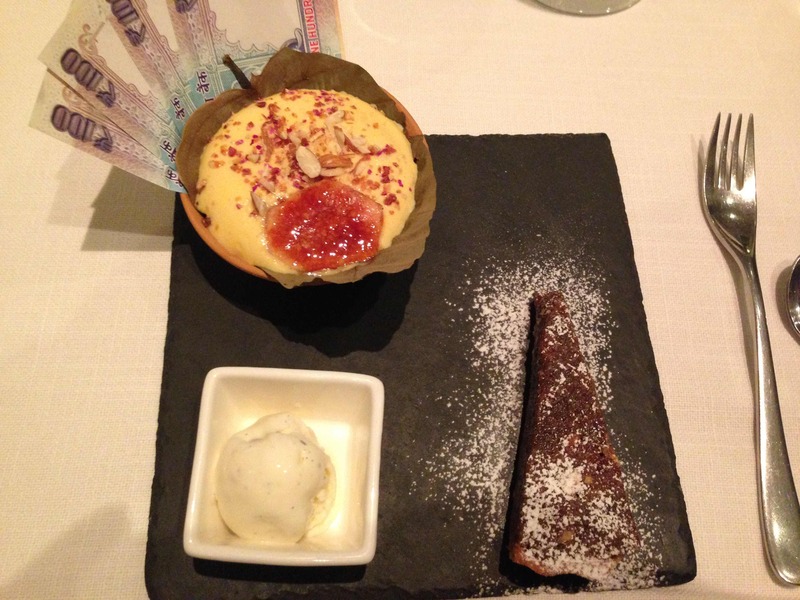 The custard apple cream was rather clumsily presented and a little lacklustre. The tart was tasty but overall dessert was disappointing and left me wishing I’d had another one of the duck kulchas. To round off the meal we were presented with a delightful plate called Childhood Memories. Sugar laden sweets including rose chikki, candied nuts and aam (mango) papad were much more exciting than the actual dessert. At Rs2,795 (plus taxes and service charge) the degustation at Indian Accent had a lot of misses, but the hits were certainly worth going back for. The experience of dining in this elegant restaurant would have made up for the misses, except that they seemed very keen to get rid of us. The entire degustation was over in about 75 minutes. What redeemed the service was the way the staff handled our complaint about the swift service. They showed genuine concern, integrity and grace, and I take my hat off to them. Would I go back to Indian Accent, definitely. But next time, I’d cherry pick items from the menu (all the duck dishes for sure and perhaps that moilee again). While I don’t think the food is of the same standard of innovation as Masala Library, the environment is more intimate which makes it well worth another visit.